The past couple of days Ellie has only wanted to go on 45 minute walks, still amazing for her age, but not quite the adventurous 60 to 90 minute walks of previous days. One thing I’ve noticed as she’s aged, in addition to the stiff legs and shortness of breath, is that at an intersection she tries to take the diagonal across instead of crossing each street in turn. She I suppose intrinsically understands the shortest distance between two points is a straight line, and at her age wants and needs to minimize effort, but it always makes me think of the famous theorem that bears Pythagoras’ name. It made a big impression on my young self when I first learned of it and I realized the world of mathematics, and our world it describes, is both profound and beautiful. Despite this I make Ellie take the long way round, crossing each street one at a time instead of taking the diagonal, as we live in the world of the automobile and it is their rules that govern our walks. She doesn’t understand, but then neither do I. 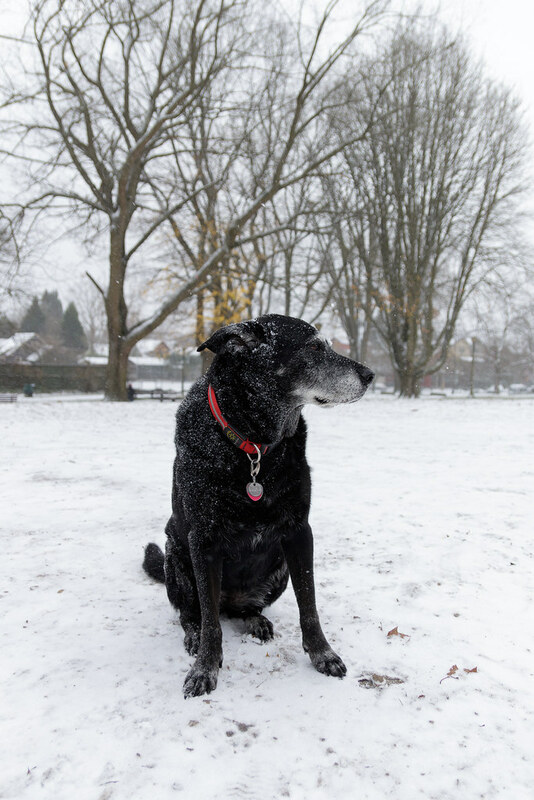 This entry was posted in Pets and tagged black lab, dog, dog park, Ellie, Irving Park, Irvington, Oregon, Portland, snow, winter. Bookmark the permalink.